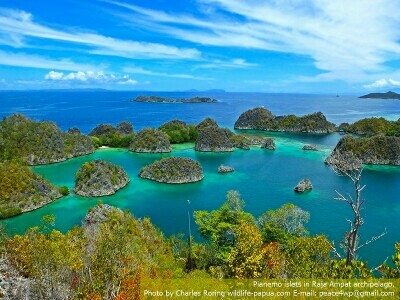 Raja Ampat (meaning four kings) is one of the most beautiful destinations in the world for marine tourism. Tens of thousands of visitors go there every year to enjoy swimming, sunbathing, snorkeling, freediving, scuba diving, birding and wildlife watching in the archipelago. There are hundreds of islands in Raja Ampat which tourists can see to enjoy their vacation. 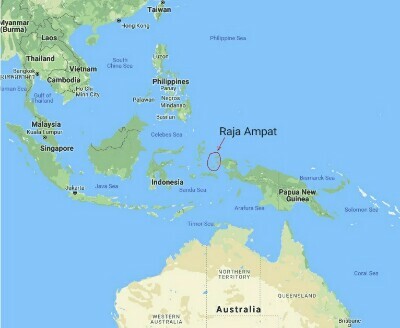 Although there are a lot of articles about the archipelago available on the internet, people still ask me where exactly Raja Ampat is? To answer this simple question, please look at the following map. Raja Ampat is a regency in West Papua province of the Republic of Indonesia. Its capital is Waisai. It is a small coastal town located in Waigeo. There are four big islands in the regency, i.e. Waigeo, Salawati, Batanta and Misool. There are also a lot of small tropical islands in the regency. Most of these islands are surrounded by coral reef and white sandy beaches with coconut, ficus, and cattapa trees grow along their coastal areas. From the air, we can see these islands look like groups of emerald jewels on turquoise and blue ocean. Under the water, we can see thousands of marine animals thrive in colorful coral reef. According to marine scientists who did researches in Raja Ampat, the marine bio-diversity of the archipelago is the highest in the world. That's why it attracts a lot of scuba divers, snorkelers, and birdwatchers to see it. The most convenient way to enjoy Raja Ampat is by staying in a nice beach resort and then do day trips to any directions of the islands. For instance, visitors can stay in Waigeo island and then visit Piaynemo karst in the first day, Kabui bay and Mansuar in the second day and then visit Wayag in the third day. Or visitors can also stay in a homestay or resort and enjoy snorkeling or diving at the house reef as well as birding and wildlife watching in the nearby forest. There are a lot of homestays and beach/ dive resorts which visitors can choose to stay. For example in Waigeo island, there are Paradisea Dive Resort, and Yengkawe homestay. In Kri island, there are Kri Eco Resort, Yenkorano homestay, and Mangkur-kodon homestay. Raja Ampat Dive Lodge in Mansuar island. In Gam island, there is Papua Explorers Resort. 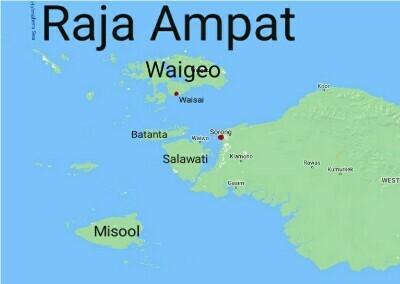 It is very easy to reach Raja Ampat, fly from your country to Jakarta - the capital of Indonesia. After that, fly to Sorong city by airlines such as Batik, Sriwijaya, and Garuda. There are ferries that go between Sorong and Waisai every day. There is also another route. Fly from your country to Singapore. After that you could continue your trip to Manado city by Silk Air and then to Sorong by domestic airline such as Garuda, Lion or Nam Air.